Joining AIM Global Australia is just an easy process just like in other countries where there is no AIM Global branch yet. December of 2016, AIM Global opens in Papua New Guinea (PNG) which is the nearest branch to Australia and after just a few months, there is a rapid growth to AIM Global PNG Distributors. If you came from Google and has found this post that tells how to join AIM Global Australia, you are on the right page. Join this amazing opportunity as AIM Global helps people change lives from ordinary to extraordinary millionaires! Scroll down below to know more details. AIM Global has been in the business for 11 years as of this year (2017) and has made a massive expansion. The company is in the distribution of health and wellness products. Engaging in this business means a potential to earn 20 USD up to 640 USD or more per day if a member will follow the system that AIM Global teaches for members. There is also a free training for members. 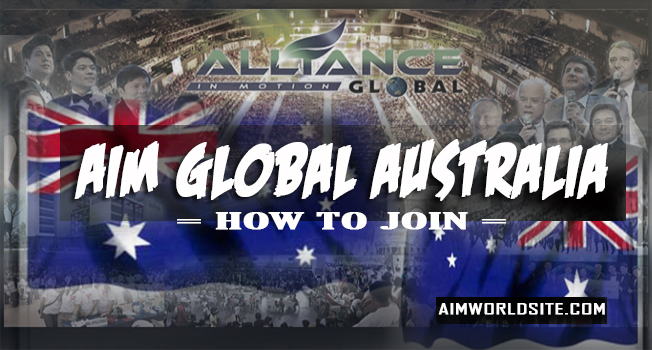 How to join AIM Global Australia? To become a member you just need to buy the membership package. The membership package cost will depend if where is the nearest office to your location because it will vary on the shipment fee added to the membership fee. You have to get in touch with the assisting coach for you to have a guide in joining. Below is the detail of the assisting coach for AIM Global Australia.